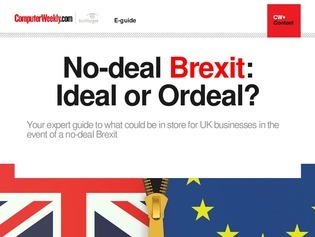 No deal Brexit: Ideal or Ordeal? Supporters of a no-deal Brexit like to claim that technology can be a solution for many of the ills that Remainers state will be the inevitable consequence of leaving the European Union – not least when it comes to the future of the Irish border (spoilers: tech is not the solution). The tech sector itself is torn on what it wants – a vocal group urge a second referendum, while others say Theresa May’s Withdrawal Agreement is the sensible way forward to protect jobs. But the tech impact of Brexit runs even deeper. Data is the oil that greases the wheels of the modern economy, and without free flows of data between the UK and its trading partners, many businesses in the UK will struggle to work with companies overseas. The UK’s data protection legislation is based on the EU’s General Data Protection Regulation (GDPR), but that doesn’t guarantee data can still flow in the event of a no-deal Brexit. In this e-guide, we bring together the latest advice for businesses on what leaving the EU without a deal would mean for your data protection strategy.